For some reason I always thought I didn’t like gin. I have no idea why, maybe I tried it once and didn’t care for it or maybe I never had it and this was just some pre-conceived notion I had. Either way, I finally had some this past winter and discovered I do indeed like gin. I even found a gin distilled right here in South Carolina that is quite tasty. With summer and warm weather coming up gin and tonic is a standard drink. I wanted to experiment a little more. I got a bitter lemon drink which is great with gin and decided to play around with that concept a little more. While it isn’t quite blackberry season here yet (that doesn’t come until June) I had a stash of blackberries in the freezer from when I picked them last summer. It isn’t really enough to bake with so I figured a cocktail was in order. Berries go extremely well with gin. So do lemons. That made this drink a no brainer. Mint goes well with both lemon and blackberries and I have plenty of that in my garden. I love a cocktail with mint in it, hello mojitos! Limoncello gives it an extra lemon punch and sweetness. I used sparkling lemonade, but you could certainly use fresh lemon juice and a simple syrup. Me, I’m more about quick and easy. Trader Joe’s makes a great sparkling lemonade as well as other sparkling juices which we use for virgin and adult cocktails, I’m totally fine with that. This weekend after Josh spends his time building a new plinko game for the school carnival and I take care of the garden and house, we’ll look forward to this drink on the porch. Sad to say, but porch season is already getting less pleasant as the bugs have started to come and the heat is really kicking in. Enjoy it while you can! 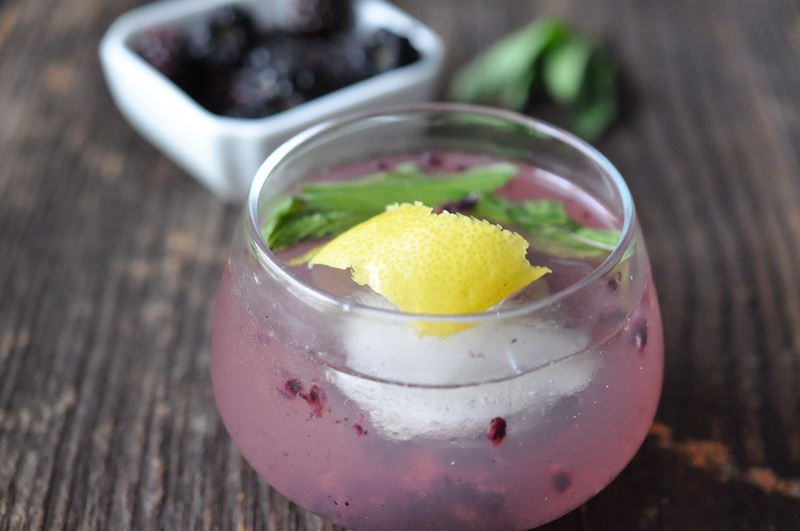 Gently muddle the blackberries and mint leaves in the bottom of a low ball glass. Add limoncello and gin, stir well. Add ice and top off with sparkling lemonade. Garnish with lemon peel and mint leaves. That looks so refreshing! I love adding fresh fruit to cocktails. What is the brand of SC gin you found? The gin is Hadley & Sons. If I remember correctly it is from North Charleston. I happen to have picked it out at Total Wine on my own, only to turn around the corner and see they were doing gin samples and had it on offer. After I tried it I knew I made the right choice! I haven’t heard of that one. I’ll have to keep an eye out for it. Copperhorse has released a gin. I haven’t tried it personally, but a friend of mine said it was really good. I have never been a gin person, but have developed a new appreciation and have been experimenting with it more the past year or so. I really like it with limeade. The Navy Strength gin packs a punch and isn’t as herbaceous as other gins. Ah yes, I enjoy my Copper Horse products too. I haven’t tried their gin yet either, next on my list. This gin is less herby, more floral and citrus in flavor. That’s my kind of cocktail Gretchen, I’m a big gin fan. There are so many boutique distilleries in Australia making their own distinctly different gins, some are so good it’s tempting to drink them straight, over ice, but that would be dangerous! I am definitely a gin fan now. We have a local distillery that just released a gin, that’s next on my list to try. Any excuse to go check out their tasting room is good for me! Oh now doesn’t that look refreshing! We are in a bit of a cold snap but back up to the seventies by the end of the weekend! It’s a great warm weather sipper. Love those colours – I’m not a gin drinker but I’d happily give that cocktail a go Gretchen! I thought I wasn’t a gin drinker either. With so many different small batch producers now the flavor range seems to be greater and more my taste. Ah, the language of gin! Add in the fresh fruit and I’m one happy girl. Now I’m not a gin drinker but I’m saving the recipe for my friends who I know will enjoy this drink. Hopefully your friends will enjoy it Karen. I never was a gin drinker until recently, now it is one of my go to for summer cocktails. Heck, any time of year here! 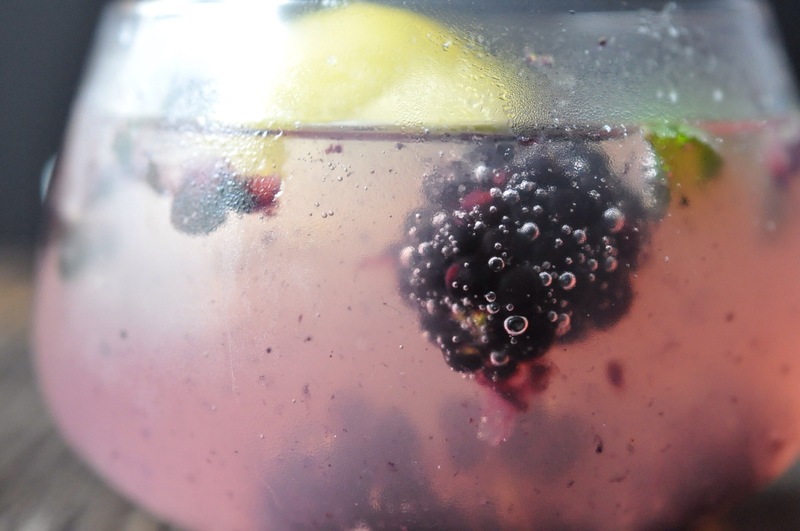 Blackberries do make a fantastic drink! My husband has put them in bourbon cocktails as well. Wow, that looks lovely Gretchen. Gin is definitely the spirit for summer. Blackberries were on sale at a local grocery store last week so we have lots. This looks like a good use for them 🙂 Sorry about your garden losses. Darn that weather. I have a couple bottles of liquor I wonder why I ever got them! Then I have the two bottles of hazelnut liqueur since I must have forgotten I already got one and bought another one!